Abstract: The aim of this study was to establish the relationship between personality traits of postmenopausal women and the presence of the 44-bp VNTR polymorphism in the serotonin transporter (5-HTT) (SLC6A4) promoter region and the 30-bp VNTR polymorphism in the MAO-A promoter region. The study’s aim was also to determine the influence of personality traits on the quality of postmenopausal women’s lives. The study involved 214 postmenopausal women from northwest Poland, with an average age of 56.8±4.08 years. It was performed using the Temperament and Character Inventory-Revised and the Short Form Health Survey. DNA polymorphisms were identified by means of polymerase chain reaction. Analysis demonstrated that the s/s genotype was significantly more common than the l/l genotype in women with higher fear of uncertainty. In a group with higher enlightened second nature and empathy, the l/s genotype was considerably more common than the l/l genotype. 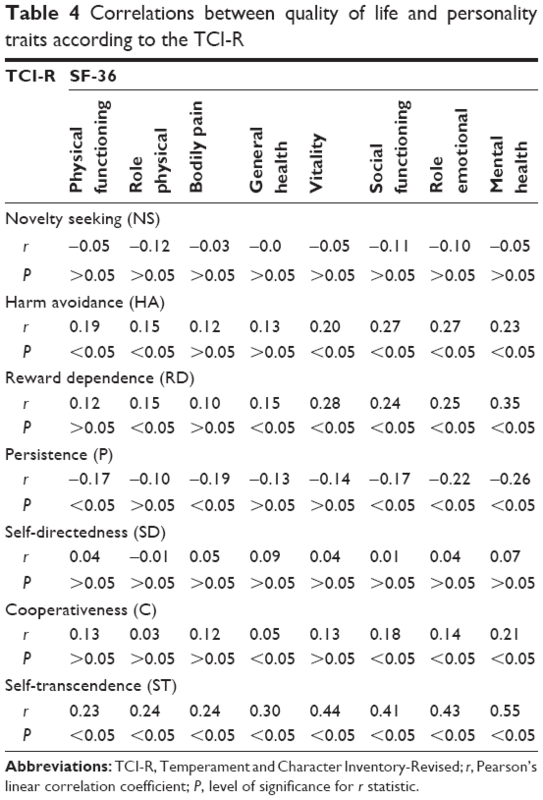 There were statistically significant associations between selected aspects of quality of life and personality traits such as enlightened second nature, transpersonal identification, purposefulness, and self-transcendence. The s/s genotype of the 44-bp VNTR polymorphism in the 5-HTT (SLC6A4) promoter region may increase the tendency to avoid harm within the fear of uncertainty dimension. Carriers of this genotype may have predisposition to anxiety and depressive disorders. The l/s genotype of the 44-bp VNTR polymorphism in the 5-HTT (SLC6A4) promoter region contributes to increased expression of enlightened second nature and empathy. Some personality traits may influence the quality of women’s lives. The aim of this study was to determine the relationship between personality traits of postmenopausal women according to the Temperament and Character Inventory-Revised (TCI-R) and the presence of the 44-bp VNTR polymorphism in the 5-HTT (SLC6A4) promoter region and the 30-bp VNTR polymorphism in the MAO-A promoter region. The study also assessed the influence of personality traits on the QoL as measured by the SF-36. The study was conducted on a group of 214 healthy volunteer women from northwest Poland, being at least 1 year after the last menstruation. In order to recruit respondents, we sent the information about the study and invitation to take part in it to primary care centers in West Pomeranian province in Poland. Those interested reported to a treatment room at the appointed time. All participants provided written informed consent to take part in this study. All participants were non-smokers, drank less than 20 g of pure alcohol per day or drank occasionally no more than 40 g of pure alcohol, and abstained from alcohol at least 2 days per week.22 Endocrine, neoplastic, and mental diseases were excluded on the basis of medical history, and mental disorders by means of a screening test performed using the Primary Care Evaluation of Mental Disorders Patient Health Questionnaire 9 for diagnosing depression. The research presented here is a part of a greater project whose aim was to determine factors presumably contributing to depression in postmenopausal women. We analyzed the influence of genetic factors on personality traits (using two standardized questionnaires, namely the NEO-FFI and the TCI) and the occurrence of depression in postmenopausal women. We also measured the severity of depressive symptoms, the QoL level, and health behaviors among postmenopausal women, depending on their sociodemographic data, the severity of climacteric symptoms, and the use of MHT. 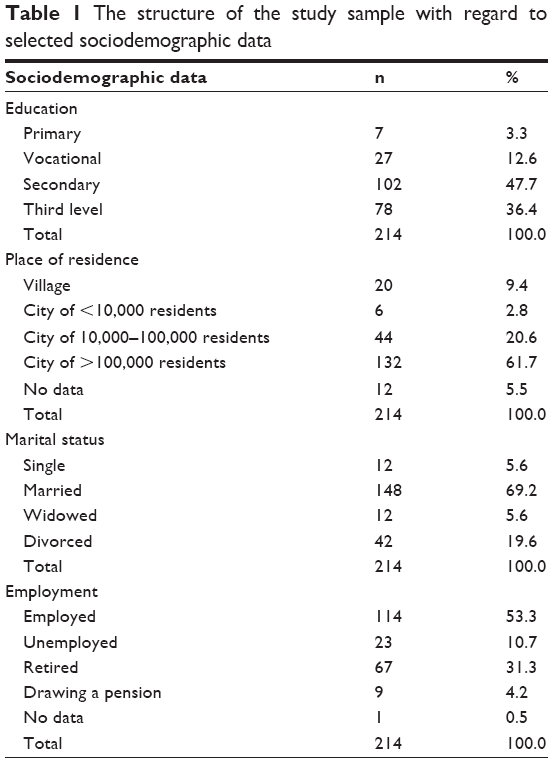 The mean age of the women was 56.8±4.08 years; 48% of them had secondary education and 36% had higher education. The majority of the respondents (69%) had life partners, and 53.3% were professionally active (Table 1). The first stage of this study was based on a survey performed using standard research instruments: the TCI-R for analyzing personality traits and the SF-36 for measuring QoL. The second stage of the study was based on genetic testing. A total of 10 mL venous blood samples were collected for genetic analysis using a closed system (Vacutainer). Biological material (blood) was collected and stored after the participants gave their written consent to this procedure. The second stage of the study was based on genetic tests. DNA was isolated from whole blood by the salting-out method of Miller. Polymerase chain reaction was used to identify DNA polymorphisms. The aim of the analysis was to amplify the fragment consisting of 2–5 repetitions of the 30-bp VNTR polymorphism in the MAO-A promoter region. The following primer sequences were used: MAO-A-F, 5′-CCC-AGG-CTG-CTC-CAG-AAA-3′, and MAO-A-R, 5′-GGA-CCT-GGG-CAG-TTG-TGC-3′. The sizes of the amplified fragments were 239, 209, 226, and 269 bp. In the 5HTT polymorphism analysis, the fragment including the 44-bp ins/del in the regulatory sequence (the presence or lack of 44-bp) was amplified. The following primer sequences were used: HTT-F, 5′-GGC-GTT-GCC-GCT-CTG-AAT-GC-3′, and HTT-R, 5′-GAG-GGA-CTG-AGC-TGG-ACA-ACC-AC-3′. The sizes of the amplified fragments were 484 and 528 bp. Statistical analysis was performed using Statistica 7.1 PL. The following tests were employed: one-way analysis of variance, Kruskal-Wallis test, multiple comparison test showing which groups differ from each other if Kruskal-Wallis test demonstrated significant differences between at least two of them, and Pearson linear correlation coefficient. The level of significance was set at α=0.05. As for the polymorphisms of the investigated genes, there were no significant deviations from the Hardy–Weinberg equilibrium. The study was approved by the Bioethical Commission of the Pomeranian Medical University in Szczecin (PUM) (permission number KB-0012/155/13). 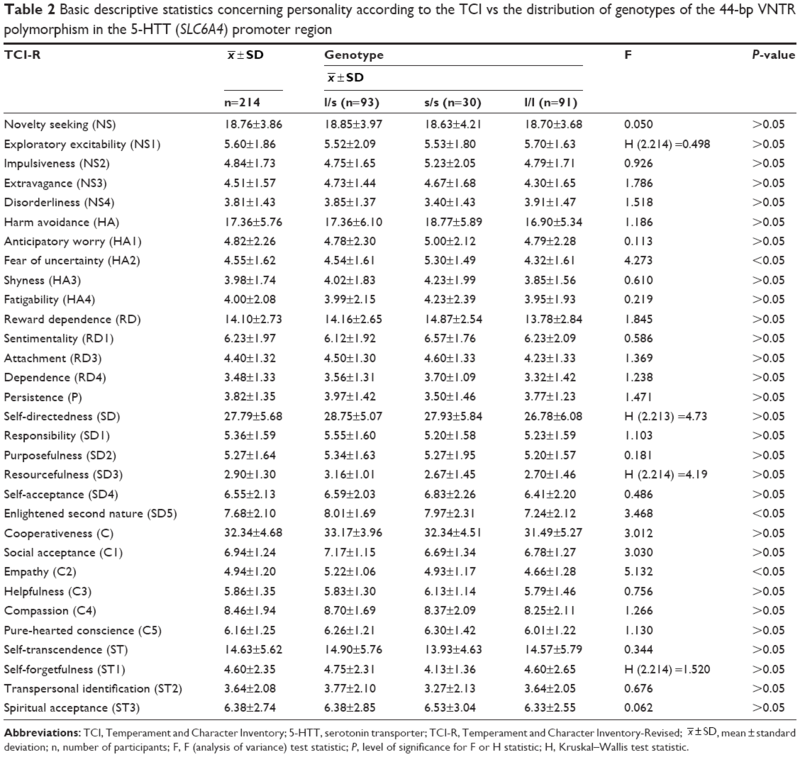 Analysis of the research material demonstrated that the distribution of genotypes of the 44-bp VNTR polymorphism in the 5-HTT (SLC6A4) promoter region was statistically significantly related to the levels of fear of uncertainty, enlightened second nature, and empathy according to the TCI (P<0.05). Among carriers of the s/s genotype, the average level of fear of uncertainty (HA2) within the HA domain was 5.30±1.49, among carriers of the l/s genotype was 4.54±1.61, and among carriers of the l/l genotype was 4.32±1.61. The average level of enlightened second nature (SD5) within the SD domain for the l/s genotype was 8.01±1.69, for the s/s genotype was 7.97±2.31, and for the l/l genotype was 7.24±2.12. The average level of empathy (C2) within the C domain for the l/s genotype was 5.22±1.06, for the s/s genotype was 4.93±1.17, and for the l/l genotype was 4.66±1.28 (Table 2). Abbreviations: TCI, Temperament and Character Inventory; 5-HTT, serotonin transporter; TCI-R, Temperament and Character Inventory-Revised; , mean ± standard deviation; n, number of participants; F, F (analysis of variance) test statistic; P, level of significance for F or H statistic; H, Kruskal–Wallis test statistic. The s/s genotype was significantly more common than the l/l genotype among women with higher fear of uncertainty. The l/s genotype was significantly more common than the l/l genotype in a group of women with higher levels of enlightened second nature. The l/s genotype was more common than the l/l genotype in women with higher empathy (Table 3). Abbreviations: TCI-R, Temperament and Character Inventory-Revised; 5-HTT, serotonin transporter. No statistically significant differences were observed between the mean scores for the TCI scales and subscales depending on the distribution of genotypes of the 30-bp VNTR polymorphism in the MAO-A promoter region (P>0.05). QoL domains according to the SF-36 and personality traits according to the TCI-R were subjected to statistical analysis. The correlation was regarded as moderate if the correlation coefficient r=0.4–0.6; the correlation was noticeable if r=0.2–0.4; and the correlation was very weak if r<0.2 (P>0.05). Analysis of the data demonstrated moderate statistically significant relationships between enlightened second nature and QoL levels in all domains, except for bodily pain. The higher the QoL in a particular domain, the lower the expression of enlightened second nature. Analysis also demonstrated moderate statistically significant relationships between transpersonal identification and SF-36 domains such as general health, vitality, social functioning, role emotional, and mental health. An increase in QoL levels in the aforementioned domains corresponded to increased expression of the aforementioned personality trait. Additionally, moderate statistically significant relationships were observed between purposefulness and vitality, social functioning, and mental health domains – the higher the QoL level, the weaker the expressed purposefulness. Moderate statistically significant relationships were also observed between ST and vitality, social functioning, role emotional, and mental health – higher QoL levels in particular domains were accompanied by increased expression of ST (Table 4). Abbreviations: TCI-R, Temperament and Character Inventory-Revised; r, Pearson’s linear correlation coefficient; P, level of significance for r statistic. In our study, increased expression of some personality traits, such as enlightened second nature, ST, and transpersonal identification, had effects on the QoL level. The published results of our previous research, based on the NEO-FFI questionnaire, demonstrated the impact of extroversion and neuroticism on all QoL domains, the influence of agreeableness on all QoL domains apart from bodily pain, and the effects of conscientiousness on all QoL domains except for physical fitness, pain, and general health. Higher neuroticism was proved to be associated with a lower QoL level, and extroversion was proved to be associated with a higher QoL level. Identification of the homogeneous groups of women at a higher risk of a decline in the QoL and development of depressive symptoms may result in the preventive care for postmenopausal women, aiming at the improvement of their functioning and reduction of adverse effects of depression. We analyzed the influence of genetic factors on expression of personality traits and measured QoL with regard to personality factors. Our study included 214 postmenopausal women. The larger size of the study sample would undoubtedly increase the scientific value of the study. Nevertheless, the research on personality traits with regard to genetic factors gives a new look at biological determinants of the QoL of postmenopausal women. The limitations of the present study do not allow us to extend our conclusions to the general population. Still, we believe that it has the potential to provide interesting findings in the field requiring further research. This study confirmed that the s/s genotype of the 44-bp VNTR polymorphism in the 5-HTT (SLC6A4) promoter region may contribute to a higher tendency to avoid harm within the fear of uncertainty dimension. Carriers of this genotype may have increased predisposition to anxiety and depressive disorders. The l/s genotype of the 44-bp VNTR polymorphism in the 5-HTT (SLC6A4) promoter region contributes to increased expression of personality traits, such as enlightened second nature and empathy. Some personality traits may influence the quality of women’s lives. Canli T, Lesch KP. Long story short: the serotonin transporter in emotion regulation and social cognition. Nat Neurosci. 2007;10(9):1103–1109. Samochowiec J, Fiszer-Piosik E, Kucharska-Mazur J, Horodnicki J. Wpływ genów na kształtowanie się cech osobowości [The influence of genes on the development of personality]. Psychiatr Pol. 2000;34(1):99–109. Polish [with English abstract]. Zakrzewska M, Samochowiec J, Rybakowski F, Hauser J, Pełka-Wysiecka J. Polska wersja Inwentarza Temperamentu i Charakteru (TCI): analiza rzetelności [Polish version of Temperament and Character Inventory (TCI): the analysis of reliability]. Psychiatr Pol. 2001;35(3):455–465. Polish [with English abstract]. Jakubczyk A, Wojnar M: Genetyczne i psychospołeczne uwarunkowania impulsywności. Post PsychiatrNeurol. 2010;19(1):39–45. Gardini S, Cloninger CR, Venneri A. Individual differences in personality traits reflect structural variance in specific brain regions. Brain Res Bull. 2009;79(5):265–270. Cheung G. Stability of the harm avoidance personality trait in late-life depression. Int Psychogeriatr. 2007;19(4):778–780. Hauser J, Dmitrzak–Węglarz M. Leksykon genetyki w psychiatrii. Poznań: Termedia Wydawnictwa Medyczne; 2010. Prazeres F, Santiago L. Relationship between health-related quality of life, perceived family support and unmet health needs in adult patients with multimorbidity attending primary care in Portugal: a multicentre cross-sectional study. Health Qual Life Outcomes. 2016;14(1):156. Steptoe A, Deaton A, Stone AA. Psychological wellbeing, health and ageing. Lancet. 2015;385(9968):640–648. Pertyński T, Stetkiewicz T. Perimenopauza. In: Pertyński T, editor. Diagnostyka i terapia wieku menopauzalnego [Diagnosis and therapy at the menopausal age]. Wrocław: Wyd. Med. Urban & Partner; 2004:313–322. Jakimiuk AJ, Postawski K. Atrofia pochwy. In: Pertyński T, editor. Diagnostyka i terapia wieku menopauzalnego. Wrocław: Wyd. Med. Urban & Partner; 2004:189–198. Rechberger T. Nietrzymanie moczu u kobiet- problem medyczny, społeczny i socjalny. In: Pertyński T, editor. Diagnostyka i terapia wieku menopauzalnego. Wrocław: Wyd. Med. Urban & Partner; 2004:41–63. Kornacewicz-Jach Z. Choroby serca i naczyń w wieku menopauzalnym. In: Pertyński T, editor. Diagnostyka i terapia wieku menopauzalnego. Wrocław: Wyd. Med. Urban & Partner; 2004:23–39. Pawelczyk L, Sokalska A. Osteopenia i osteoporoza wieku menopauzalnego. In: Pertyński T, editor. Diagnostyka i terapia wieku menopauzalnego. Wrocław: Wyd. Med. Urban & Partner; 2004:238–249. Cohen LS, Soares CN, Vitonis AF, Otto MW, Harlow BL. Risk for new onset of depression during the menopausal transition: the Harvard study of moods and cycles. Arch Gen Psychiatry. 2006;63(4):385–390. Skałba P. Przekwitanie, klimakterium. In: Skałba P, editor. Endokrynologia ginekologiczna. Warszawa: Wydawnictwo Lekarskie PZWL; 2008:304–305. Speroff L, Glass RH, Kase NG. Clinical Gynecologic Endocrinology and Infertility. 6th ed. Baltimore: Lippincott Williams and Wilkins; 1999. Pertyński T. Diagnostyka i terapia wieku menopauzalnego [Diagnosis and therapy at the menopausal age]. Wrocław: Wyd. Med. Urban & Partner; 2004. Ratajczak Z. Jakość życia człowieka w warunkach narastających zagrożeń. Warszawa: Wyd. Uniw. Warszawskiego; 2005. Dąbrowska J, Naworska B, Dąbrowska-Galas M. Rola wysiłku fizycznego w okresie menopauzy. Prz Menopauz. 2012;6:445–448. State Agency for Solving Alcohol Problems [homepage on the Internet]. Available from: http://www.parpa.pl/index.php. Accessed November 15, 2016. Szekely A, Ronai Z, Nemoda Z, Kolmann G, Gervai J, Sasvari-Szekely M. Human personality dimensions of persistence and harm avoidance associated with DRD4 and 5-HTTLPR polymorphisms. Am J Med Genet B Neuropsychiatr Genet. 2004;126B(1):106–110. Stein MB, Campbell-Sills L, Gelernter J. Genetic variation in 5HTTLPR is associated with emotional resilience. Am J Med Genet B Neuropsychiatr Genet. 2009;150B(7):900–906. Jylhä P, Isometsä E. The relationship of neuroticism and extraversion to symptoms of anxiety and depression in the general population. Depress Anxiety. 2006;23(5):281–289. Walderhaug E, Lunde H, Nordvik JE, Landrø NI, Refsum H, Magnusson A. Lowering of serotonin by rapid tryptophan depletion increases impulsiveness in normal individuals. Psychopharmacology (Berl). 2002;164(4):385–391. Paaver M, Kurrikoff T, Nordquist N, Oreland L, Harro J. The effect of 5-HTT gene promoter polymorphism on impulsivity depends on family relations in girls. Prog Neuropsychopharmacol Biol Psychiatry. 2008;32(5):1263–1268. Paaver M, Nordquist N, Parik J, Harro M, Oreland L, Harro J. Platelet MAO-activity and the 5-HTT gene promoter polymorphism are associated with impulsivity and cognitive style in visual information processing. Psychopharmacology (Berl). 2007;194(4):545–554. Caspi A, McClay J, Moffitt TE, et al. Role of genotype in the cycle of violence in maltreated children. Science. 2002;297(5582):851–854. Laqua C, Zill P, Koller G, Preuss U, Soyka M. [Association between the MAOA-uVNTR polymorphism and antisocial personality traits in alcoholic men]. Fortschr Neurol Psychiatr. 2015;83(3):162–169. German [with English abstract]. Schneider-Matyka D, Jurczak A, Samochowiec A. Analysis of personality traits and their influence on the quality of life of postmenopausal women with regard to genetic factors. Ann Gen Psychiatry. 2016;15(1):25. Cloninger CR, Zohar AH. Personality and the perception of health and happiness. J Affect Disord. 2011;128(1–2):24–32. Bonacchi A, Miccinesi G, Guazzini M, et al. Temperament and character traits associated with health-related quality of life in cancer patients. Tumori. 2012;98(3):377–384. Boyette LL, van Dam D, Meijer C, et al. Personality compensates for impaired quality of life and social functioning in patients with psychotic disorders who experienced traumatic events. Schizophr Bull. 2014;40(6):1356–1365. Di Nicola M, Tedeschi D, Mazza M, et al. Behavioral addictions in bipolar disorder patients: role of impulsivity and personality dimensions. J Affect Disord. 2010;125(1–3):82–88.